Dr. Koichi Wakata was born in 1963, in Saitama, Japan. He received B.S.in Aeronautical Engineering in 1987, M.S.in Applied Mechanics in 1989, and Doctorate in Aerospace Engineering in 2004, all from Kyushu University. From April 1989 to May 1992, Dr. Wakata worked as an aircraft structural engineer for Japan Airlines. 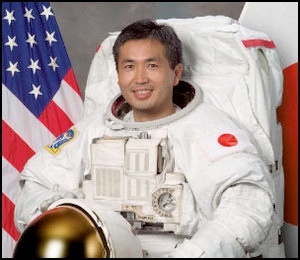 In April 1992, Dr. Wakata was selected as an astronaut candidate by the National Space Development Agency of Japan (NASDA, currently Japan Aerospace Exploration Agency). He started training in the 14th National Aeronautics and Space Administration (NASA) astronaut class in August 1992 and was qualified as a Mission Specialist (MS) in August 1993. Dr. Wakata’s technical assignments at the NASA Astronaut Office to date include: Space Shuttle flight software verification, Space Shuttle payloads, the Japanese Experiment Module “Kibo” of the International Space Station (ISS), Space Shuttle and ISS robotics, Extravehicular Activities (EVAs), the on-orbit inspection systems of the Thermal Protection System as part of the Space Shuttle’s return to flight activities, and ISS operations. During the STS-85 mission in August 1997, Dr. Wakata was the NASDA Assistant Payload Operations Director for the Manipulator Flight Demonstration, a robotic arm experiment for the Japanese Experiment Module of the ISS. Dr. Wakata operated the robotics system on NASDA’s Engineering Test Satellite VII in the tele-operation robotics experiments in March 1999. He was qualified as a NASA instructor astronaut for robotics in December 2000 and for EVA in July 2008. In December 2006, Dr. Wakata completed flight engineer training for the Russian Soyuz TMA spacecraft. He served as the Chief of the Space Station Operations Branch of NASA’s Astronaut Office from March 2010 to February 2011 as well as the Chief of the JAXA Astronaut Group from April 2010 to July 2012. He has logged over 2700 hours in a variety of aircraft. In January, 1996, Dr. Wakata flew as the first Japanese Mission Specialist on STS-72 and performed several tasks including robotics operations for the retrieval of the Japanese Space Flyer Unit satellite (launched by a Japanese H-II rocket in March 1995), for the deployment and retrieval of the NASA OAST Flyer satellite, and for the support of the spacewalks. In October 2000, he became the first Japanese astronaut to work on the ISS assembly on STS-92, during which he was responsible for the robotics operations to install the Z-1 Truss and Pressurized Mating Adapter-3 to the ISS as well as to support the spacewalks. In July 2006, he served as the Commander of the 10th NASA Extreme Environment Mission Operations (NEEMO) mission, an undersea expedition at the National Oceanic & Atmospheric Administration’s Aquarius habitat. From March to July, 2009, Dr. Wakata flew as the first resident ISS crew member from Japan and served as a Flight Engineer and the JAXA Science Officer on the crews of Expeditions 18, 19 and 20 as well as a Mission Specialist on STS-119 and STS-127 (2J/A). His duties during the four-and-half month flight included the installation of the S6 Truss, the final assembly of Kibo, a variety of experiment operation in science, engineering, art, and education, as well as ISS systems operations and maintenance. In addition, Dr. Wakata operated all of the current human space robotics systems – Canadarm on the Shuttle, Canadarm2, Dextre, and Kibo’s robotic arm on the ISS. He became the first Japanese astronaut to fly aboard Soyuz TMA spacecraft on orbit. A veteran of three space flights, Dr. Wakata has logged a total of 159 days, 10 hours, 46 minutes and 5 seconds in space. In February 2011, he was assigned as a Flight Engineer of ISS Expedition 38 and the Commander of Expedition 39. He will be the first Japanese astronaut to command the ISS.